As you know our studio is devoted to our mother Hamide. We lost her on the 25th of February 2013 in Copenhagen, 5 days after her birthday. 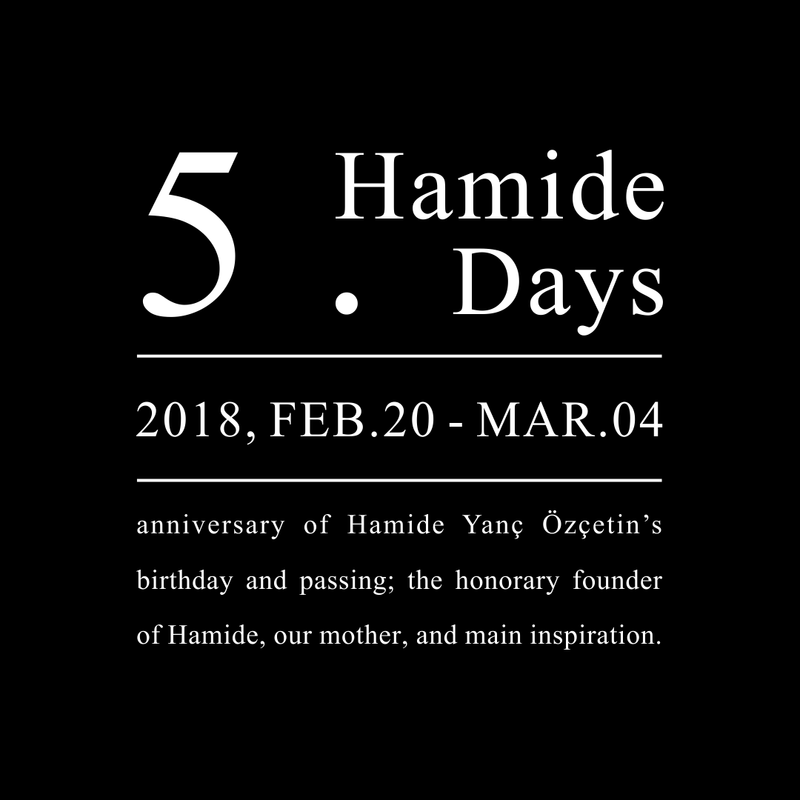 On the 1st anniversary of her passing, we initiated Hamide Days covering the period from her birthday 20th of February to her funeral day 4th of March. Hamide Days are cultural days during which we organize various activities and events, so far free for public, such as exhibitions, collection launches, postcard writing events, workshops, and so on. In the previous years, we designed the collection “She is an Eastern Bird” and “H for Hamide” specifically for Hamide Days. Previously, we have also organized postcard writing events, an exhibition where we presented her works and belongings, the “Leftovers” exhibition which presented our lead designer Seda Ozcetin’s one of a kind paper works as well as an upcycling workshop. Unfortunately this year, during the 5th Hamide Days, we haven’t had any physical events due to the fact that we are going through a very difficult period as a result of our human rights being violated by the Danish Immigration Office. In addition to that, we observed great deal of insensitivity towards the injustice in society. We did not get the support that we deserved. Moreover, we were even abused by our lawyers. Therefore, we feel extremely broken. Thus, unfortunately this year we weren’t able to organize any physical and social events. However, we are still offering %25 discount on the collections that we designed specially for previous Hamide Days for you to enjoy the art. Regardless this is a prefect period to remember and present Hamide´s work and values. Hamide was extremely humble and ethical. She was so good at her job. Her designs required high skills to execute and she had those skills in the level that probably most of us will never reach. Knowing and respecting the materials was very important for her. She could not waste anything; materials, resources, people’s effort, time. She lived a very sustainable and minimal life. Through the way she lived and created she changed the world for better. Her work was geometrical, minimal, structural, but also bold, maximalist, unconventional. Hamide suffered from a neurological illness. When we moved together with her to Copenhagen in 2011 to realize her dream and our dream; to have a design brand, we knew that she was living her last years and she would pass away here. Copenhagen is the place where we realized this dream, her last home and her rebirth place. Therefore we have so much love for Copenhagen and this is a very special place for us. But unfortunately she was and we were discriminated in Copenhagen; at the hospitals, at the immigration office, and by various people in the society. She was treated horribly and we had a traumatic experience as we lost her due to this. Despite our love for Copenhagen we will not forget what happened. The experience was inhuman and it is about all of us. Therefore, Hamide Days is significant in the sense that we remember this and remind ourselves what is not acceptable and that we should stand up for justice. Hamide was a magnificent person. Her values and design approach guide us and Hamide Design Studio. We are changing the world for better with Hamide.